Wolf spider mother with egg sac. I picked up this large mama wolf spider with her egg sac while out doing field work. The trip home apparently disturbed her, because I was disappointed to see she dropped her egg sac and apparently abandoned it. Then a few days later it vanished. Then she constructed a refuge of webbing coated in dirt and debris and closed herself in. 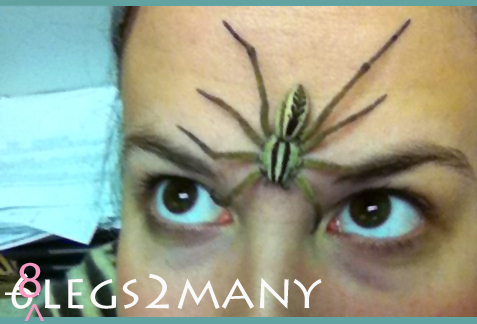 A few more days later I noticed she had an egg sac again–and it was bigger than ever. Intrigued, I sent the picture above to friend and former post-doc in my lab Shawn Wilder. Shawn introduced me to working with fire ants and also happens to have done his Ph.D. work on sexual cannibalism in wolf spiders. Beautiful spider. It looks like the genus Hogna, most likely Hogna carolinensis (they’re one of the more common big Hogna in Texas). 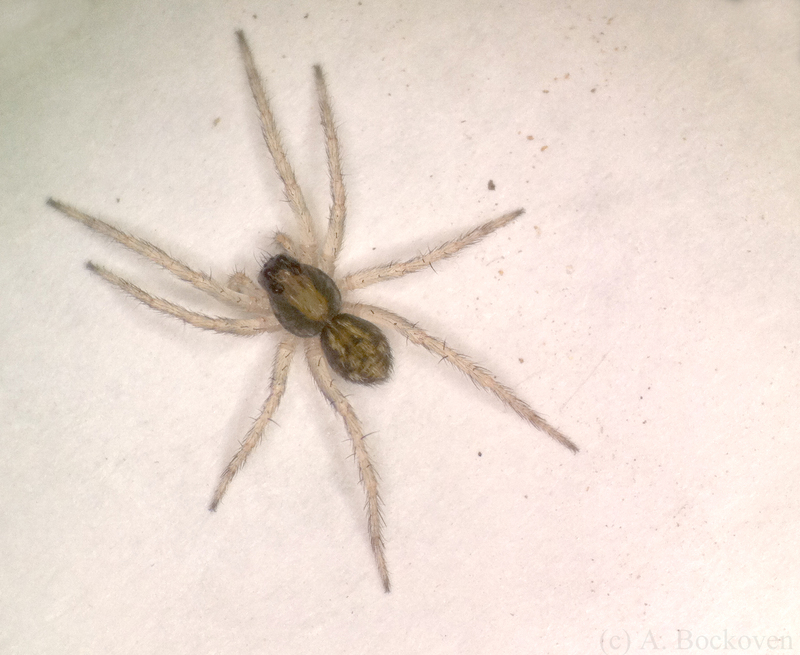 I studied Hogna helluo for my Ph.D. but they’re not quite as pretty as carolinensis because helluo doesn’t have the mottling on the legs. That’s typical Hogna behaviour. They will build a silk-lined burrow and will eat their egg sacs if they lose sight of them and refind them. It looks like she is trying to warm up her egg sac in the sun. 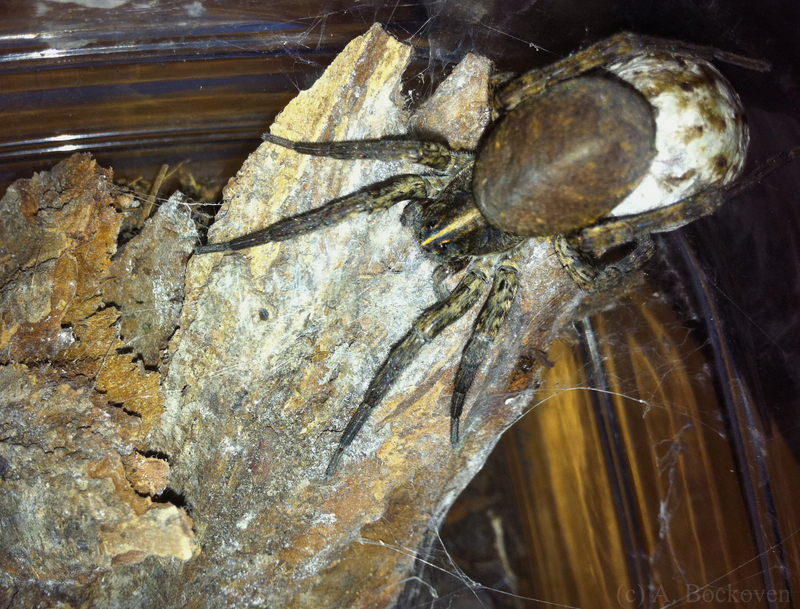 That’s a mega-huge egg sac she has. It should be very fun when the babies crawl out and onto her body because when there are tons of babies the mom has to use her pedipalps like windshield wipers to keep the babies away from her eyes! I had managed to completely forget that wolf spider mothers carry their babies around on their backs so I was pretty psyched. And mama spider delivered this week. Mother wolf spider with a back full of baby spiders. Shawn also pointed out that the spiderlings don’t need to eat at this point. For a week or two they ride around on their protective mother, clinging to special barbed hairs, and then gradually begin to disperse. Every so often a few spiderlings will drop off and walk away from the mother, providing a very effective way for the young to disperse over a wide area in nature. Of course, if sufficiently disturbed the spiderlings may scatter early–probably accounting for urban legends of wolf spiders that “explode into little spiders” when stepped on. 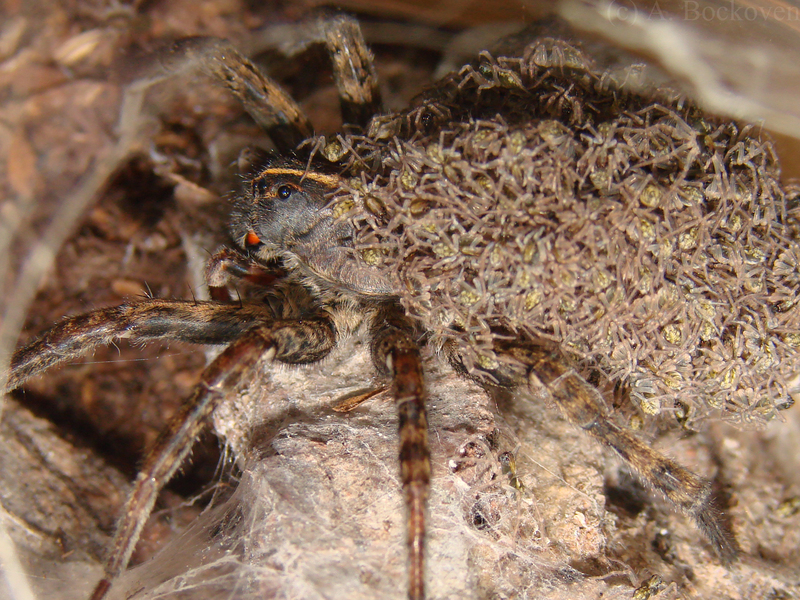 Close up of mother wolf spider carrying babies. One of the spiderlings explores a finger. So it’s that time of year (the really, crazy busy time), and I think we should take a little humor break this week. So, for your viewing pleasure, here is a list of my favorite search terms that have somehow led people to my blog. Some of these I like for their sheer baffling irrelevancy, some for their unintended meanings, and some for the stories my mind makes to explain them. Also, if you haven’t checked it out, you should drop in on Collin’s new blog, Advanced Degrees, for funny pictures of graduate school life. I think this fills a very important gap in the humor blogosphere, because grad life is, frankly, ridiculous. Like the time I found the note “Email Ingram about Brains” on my planner and realized I had become a mad scientist. If you have any good pictures (and I know you do) please take a moment to send them his way! 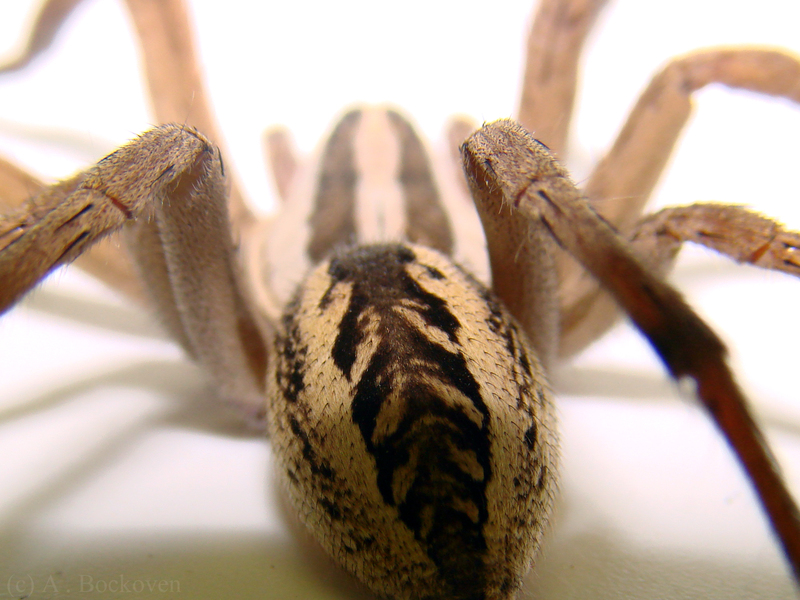 Close up of wolf spider head (Lycosidae). I’ve been playing around with extreme close ups. It’s been fun! 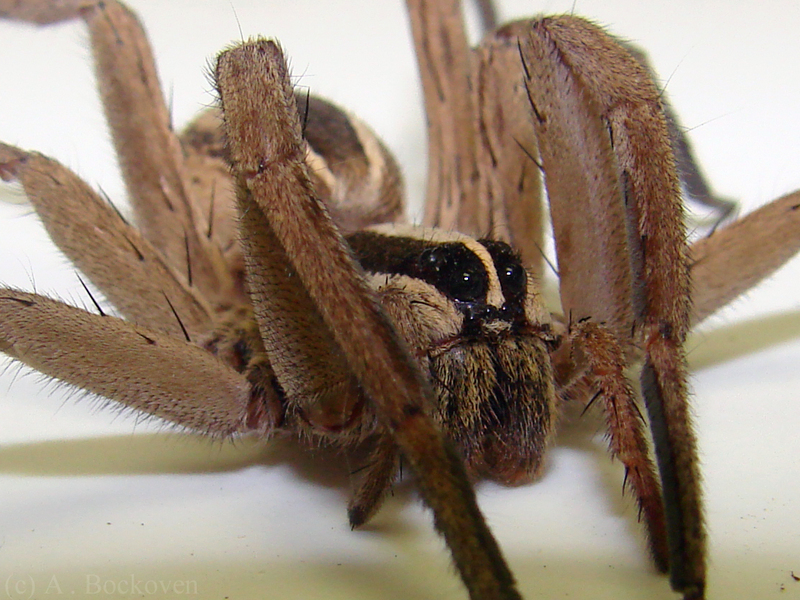 In these pictures, you can really see the combination of “hair” types that give wolf spiders their furry, wolf-like appearance. Vibrations of these hairs help the spiders sense the movement of their prey, while other hairs contain chemoreceptors that let them ‘taste’ airborne odors. Meanwhile, the hairs on a female wolf spider’s abdomen also have special spines and knobs, to help her babies keep their grip while they ride in safety. Close up of wolf spider abdomen. 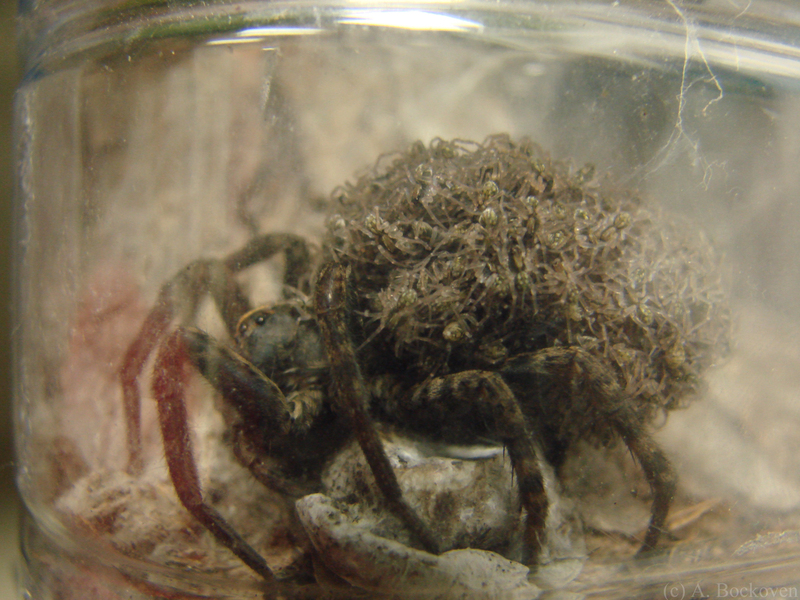 A mother wolf spider and her egg sac. Ran across this huge wolf spider in Argentina. She was sitting smack in the center of an equally huge cow patty, which is not exactly photogenic, but at least she showed up nicely. Under her abdomen you can see her egg sac, which looks nearly bigger than she is. 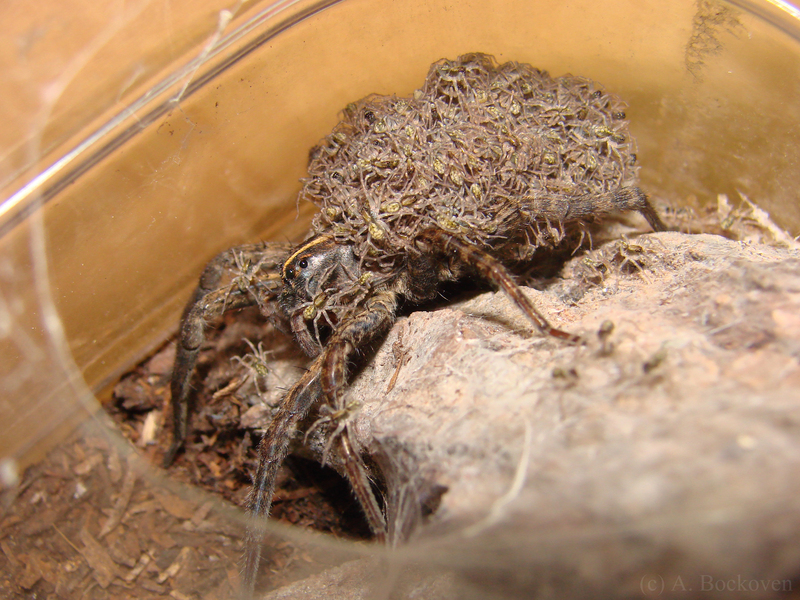 This is one way in which female wolf spiders provide parental care; by wrapping their eggs up in a silken ball, and carrying it with them to protect it from predators. Many also carry the newly hatched spiderlings on their abdomen. 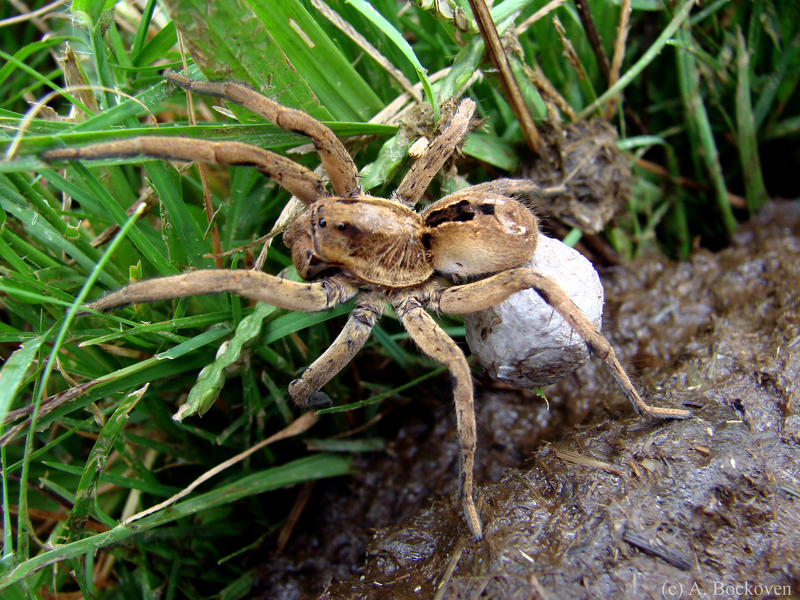 Wolf spiders hunt sans web, prowling the ground and tackling prey one-on-one. They take their name from their hairy appearance and hunting style.